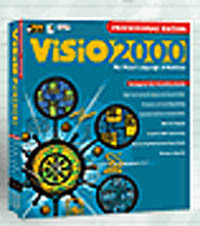 Visio Corporation000 Professional Edition gives you a clear picture of the networks, databases, software, processes, and Web sites you have, and even start planning for the ones you want. The diagramming tools translate the day-to-day IT systems into a visual language that is easier to understand. This is an automated IT design and documentation tool. Enterprise Edition files can be viewed and annotated in Professional Edition so, as projects move through your organization, the associated documentation can move with them. , 2211 Elliott Avenue, Seattle, WA 98121-1691. Phone: 206-956-6000; Fax: 206-956-6001.